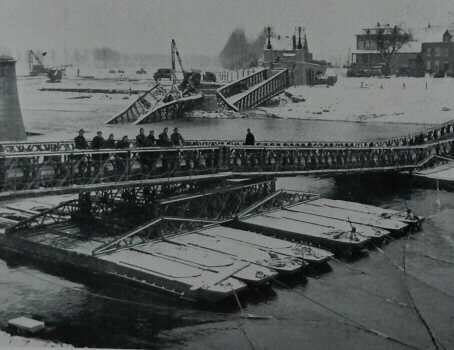 Excellent photographic record of the many different types of bailey bridge, often beside the shattered structure they replaced, which were built in hazardous wartime and weather conditions to take the allied armies into Germany. Includes a good descriptive text. Large 4to. (viii) + 193 + (5)pp, incl. many photo plts. Publisher's cloth. 3 extra contemporary photographs loosely inserted in front.